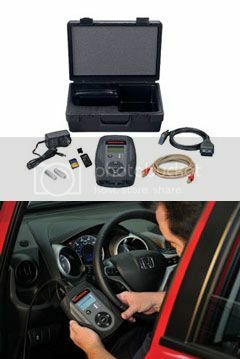 As a theft deterrent, most all late model Honda vehicles come equipped with an immobiliser ignition system that requires a remote transponder key to start the vehicle. The immobiliser system is designed to prevent the vehicle from being started without the owner’s remote ignition key. If an attempt is made to start the vehicle with any other key, the immobilizer system disables it from starting. 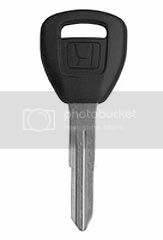 Your Remote Honda Transponder key. Basically, your Honda remote transponder key has a chip in it that emits a signal to the vehicles PCM computer. If the PCM accepts the signal, the car either unlocks or starts, depending on what the driver is trying to do. This is not a key you can run down to the hardware store or the home improvement store to replace or duplicate. Should you ever need to replace a lost key or just want a spare, Honda Mall of Georgia can take care of you. The Honda Mall of Georgia Parts Department has the latest most advanced equipment to cut a duplicate remote key for your Honda perfectly! ***NOTE*** NEVER attempt to use a key that is not a Genuine Honda Key. This is a safety related item that quality should not be compromised. 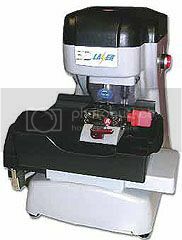 Our Parts Department also has programming devices that can copy the transponder chip signal is SOME applications and program a key for an existing key. For these models, the key does not have to be programmed to the PCM by our service department. You can just come to our Parts counter at Honda Mall of Georgia with your existing master key and we can duplicate it for you in a few minutes. The most newer model vehicle remote keys will need to be programmed by the service department. Once the remote transponder key is cut it will need to be programmed to your vehicle. All Honda Mall of Georgia technicians is fully trained on the programming equipment that is only available through American Honda. Once our technician has your vehicle they will access your PCM by...The Honda MVCI unit and program your keys to the immobiliser unit. This changes the code in your vehicles computer so all your existing keys will have to be reprogrammed as well. So be sure to bring all your keys when you have this done. If you lose your remote keys. If you lose the keys to your Honda and need a replacement, here is what you will need. While we can cut a key for your Honda by the VIN number we still need your original key or (in most cases) your car to program the key. Otherwise you still won't be able to start it. Obviously, if you have lost the only keys to your Honda...this can be problematic. The procedure varies a bit from model to model. Contact Honda Mall of Georgia directly and we will give you the specific procedure for your Honda. Your Honda is equipped to accept a procedure which will temporarily bypass the immobiliser and allow you to start the vehicle temporarily. This will allow you to drive to Honda Mall of Georgia to get a programme key. Of course, to do even this you will still have to get a temporary key cut just to turn the ignition and proceed with the by-pass. 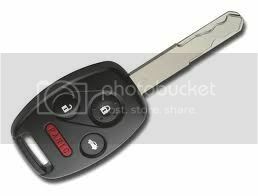 Once we have cut the temporary key for you, give us the VIN# for your vehicle. 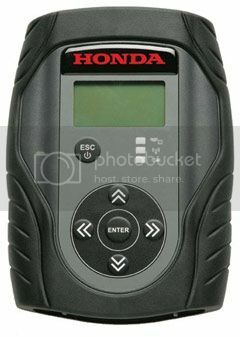 From there we can access Honda's database and obtain a "PCM brake code". The PCM brake code is a 5 digit code. The procedure for entering the brake code is a series of turning your ignition to the ON position then tapping your brake or pulling your emergency brake handle up and down for a fixed count. For example, if the first digit in the brake code is a 4. Release your parking brake and turn your ignition to the ON position. Now set and release your parking brake 4 times and turn your ignition to the LOCK position. The first digit is now set. Repeat this procedure for the remaining 4 digits. After you enter the 5th digit and turn the ignition to the LOCK position, the immobiliser indicator blinks three times and then goes off. You can now start the engine with the temporary key. NOTE: This procedure is only a temporary fix. When you start the engine with the temporary key, the immobiliser system indicator comes on and stays on while the engine is running. Also when you turn the ignition to the LOCK (0), the indicator does not blink five times as it normally would. Start the engine within 10 minutes...or you must repeat the procedure entirely. Always bring some form of identification with you to have a replacement key cut or obtain a brake code. Ideally, a drivers license and insurance card for the Honda in question. Remember...this is a theft deterrent system. Honda Mall of Georgia will not cut a key for just anyone who shows up with your VIN#. Our primary concern is for the safety of our customers and protection of their property. Feel free to contact us with any questions you have about this process. phone, email or during regular business hours by live chat. HONDA'S MOST COMMON TRANSPONDER KEYS. This style key fits many Honda models and prices vary greatly from model to model. If your key has the remote buttons on it it must be programmed by our service department. Bring ALL other keys for this vehicle with you as they will have to be reprogrammed as well. This style of key is referred to as a Sidewinder key. Named because of the unique sidewinder style cut. these sidewinder keys while the primary key for most Honda's, can also serve as a secondary key for those vehicles. Some sidewinder keys can be cloned by our Parts Department eliminating the need to run your Honda through the service department. This can save you time...and the expense of programming the PCM. On your Sidewinder key will be a stamp on the metal part of the key. It will have one of the following. V - V keys must be programmed by our service department. H- H keys must be programmed by our service department. S - S keys can be cloned here in our Parts Department. F - F keys can be cloned here in our Parts Department. T5- T5 keys can be cloned here in our Parts Department. Blank- If the key had no markings it can be cloned here in our Parts Department. This style key fits primarily 1998 1999 2000 2001 2002 and some 2003 models. ACCORDS, CIVICS, INSIGHTS, ODYSSEYS AND S2000. through the service department. However if you lose all your keys the service department will have to program a new one for you.